In a small street a short distance from Trafalgar Square, stands a row of Georgian terraced houses. These dwellings look no different to many of the other homes in the area, but only one of them was home to a Founding Father of the USA. Benjamin Franklin lived and worked here for 16 years, and the house is now a museum dedicated to the American polymath. 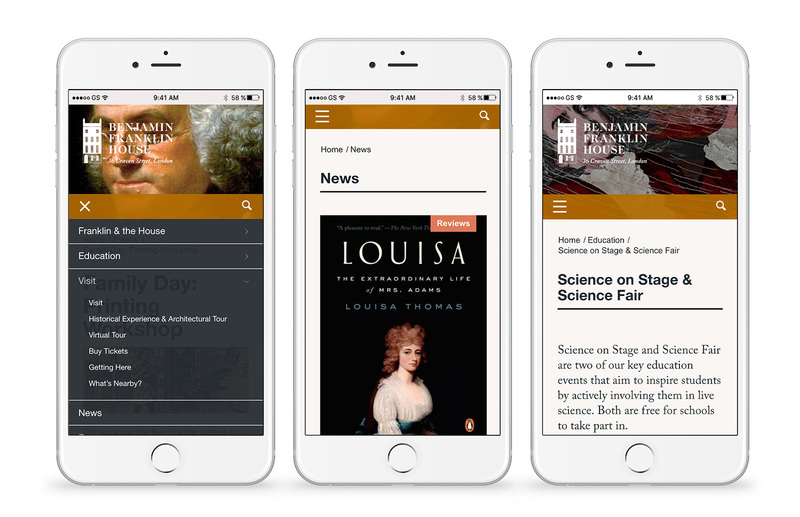 Working in close collaboration with the team at Craven Street, we designed the new website to give visitors a real sense of what is offered at the Franklin museum, with a wealth of content so even those who are unable to visit in person will be able to learn about the great man’s life. An intuitive interface, matched with thematic styling, makes this website a joy to look and to use. The site has seen increased online and physical visits and a greater understanding and appreciation in the UK of Benjamin Franklin’s historical significance.